FoodSaver GameSaver Deluxe is a compact-sized sealer for personal kitchen. The durability, performance and design are impressive and make a protection shield to save food. 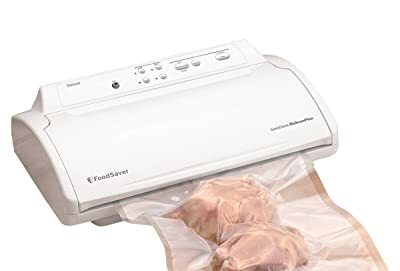 Now, no more wasting food because this vacuum sealer will vacuum and seal plastic bag efficiently. Light indicator will show the vacuum sealing status; on the contrary, wide sealing area makes it easier to seal the bags! You will get some outstanding and beneficial features in FoodSaver GameSaver. The features will not only help you to get good sealing but also reduce the risk of wasting foods. The vacuum sealer offers 2 seal levels in order to protect both moist and dry foods. As a result, this has become easy for you to seal any type of food and reduce wastage. For that reason, you can store your cooked food and enjoy it the next day too! By using the adjustable speed level, you can select the speed of vacuuming and sealing. For vacuuming delicate items, you can use the gentle speed and stop whenever you need. Don’t forget that the machine will go to default speed automatically after every sealing. Lights on the top of the vacuum sealer will provide you the process status and progress very easily. For that reason, you can notice the light indicator while using the vacuum sealer in order to know the progress. You should unlock the latch of the vacuum sealer as soon as the lights turn-off. Foodsaver Gamesaver Deluxe Vacuum Sealing Kit also provides enough accessories equipments to seal mason jars, canisters and other glass jars. Moreover, you will have a marinate device in order to marinate it within a short time. Are you fed up with using external roll storage for your sealing machine? Then, this is completely made for you because it offers built-in storage for roll with slide cutter. So, pull the roll according to your requirement and use the cutter to cut it! Cleaning as well as preventing the liquid from overflowing is easy in the vacuum sealer because it offers antibacterial drip tray. The tray not only ensures to prevent the intensification of bacteria but also catches liquids to save the machine! It must be cleaned when you are not using the sealer. The vacuum sealer also offers start kit that includes 2 bag rolls and 10 pre-cut bags. For that reason, you will not need to pay for buying the bags for couple of days. Although most of the features of the FoodSaver GameSaver are extremely well, it has a unique aspect for you too! How many of you notice ‘crush-free instant seal’ on vacuum sealers? Only a few numbers of machines have the feature. Thanks to the model because it offers Crush-Free Instant Seal to the users. Crush-Free Instant Seal By using the vacuum sealer, you can also seal the fragile and delicate items very easily. Therefore, chips packet and other items can easily be stored using this machine. So! Don’t hesitate to buy the largest packet of chips and enjoy it for a long time because you have crush-free instant seal machine! First of all, put the roll into the built-in storage and cut the bag using the slider. However, you can also buy a normal sized plastic bag for storing your food. Put food in the plastic bag and open the vacuum sealer using the unlock button on the side. Place the back end of the bag in the vacuum channel and close the vacuum bar. Don’t forget to lock button and push the vacuum seal button. As soon as you push the button, this will start vacuuming, then, start sealing. The red light indicates the sealing process. When the red light off, you will have a vacuum sealed bag! For maintaining the vacuum sealer, you must clean it regularly using a soft towel or paper towel. This is an essential task for all the vacuum sealer users because this keeps the sealer free from dust. If you do not clean the vacuum sealer for a long time, you will face mechanism problem. You need to clean the drip tray regularly, which helps to collect overflow liquids. The drip tray is very easy-to-remove and clean in order to keep the machine safe. FoodSaver GameSaver Deluxe is the model to change your daily kitchen routine. People love the model because of its efficiency, compact design, lightweight, and having both automatic and manual settings to us. This is in the list of the best vacuum sealer for sous vide to store food. Crush-free instant seal gives you the power to save your fragile items without crushing. So, isn’t it a perfect model for your kitchen to enhance kitchen power?